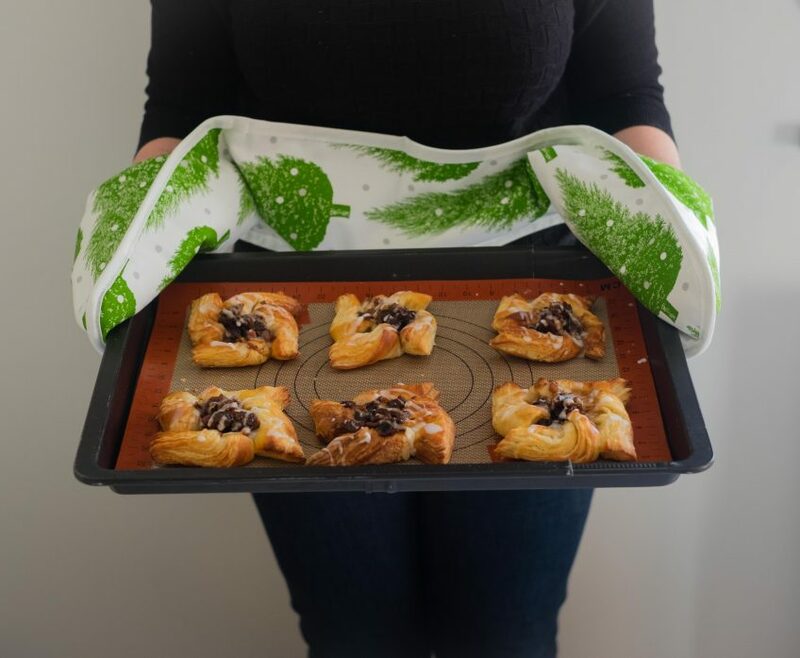 I know it might seem a little early to be thinking about Christmas recipes like these mincemeat Danish pinwheels, but next weekend is stir-up Sunday. This is an Anglican term referring to the last Sunday before advent. It has been a tradition since the Victorian times for families to get together and stir the Christmas pudding, before it is cooked and then put away ready for Christmas day. In honour of stir up Sunday, I have made a big batch of mincemeat, which I have used here to fill my Danish pinwheels. This mincemeat is lighter than your normal mincemeat as it doesn’t contain suet and the whole thing takes about 30 minutes to make. You just combine all of the ingredients in a pan, heat gently and then add the alcohol and place the mincemeat in sterilised jars. The mincemeat is great in anything from mince pies, strudel or even added to sponge pudding or an apple crumble. You’ll definitely wish you made more once you’ve tasted it. 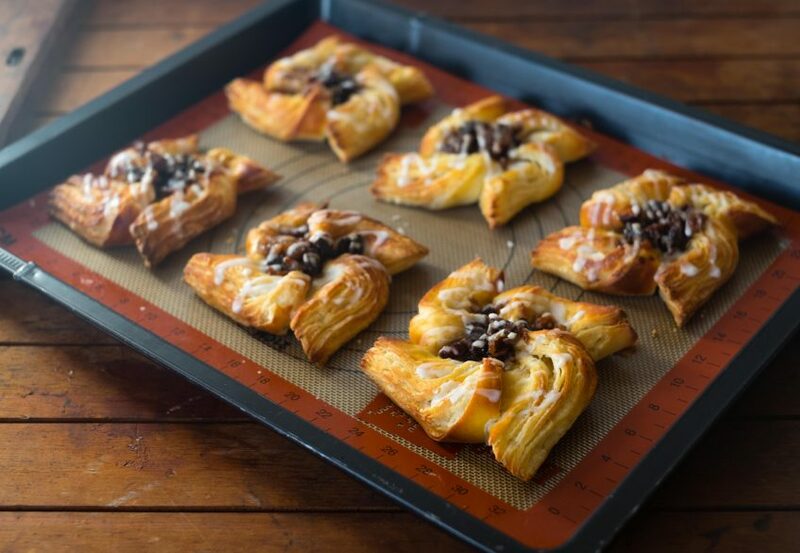 These mincemeat Danish pinwheels are a great thing to bake, they taste fantastic and they are great for breakfast. 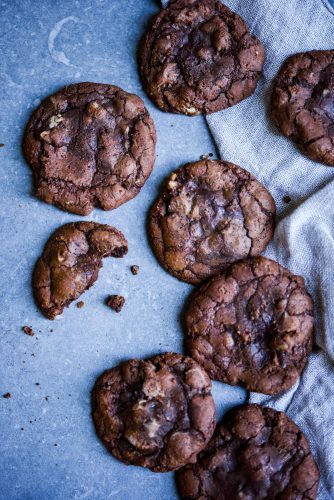 Perhaps you could even have them on Christmas day, the dough freezes really well and you could make them the day before and warm them through and decorate them just before serving. 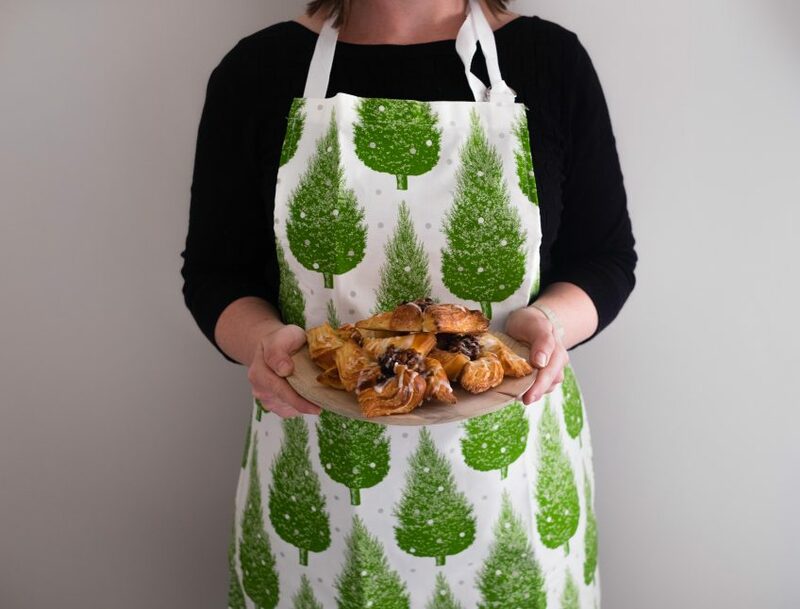 To get me in the festive mood when making these pastries, Thornback & Peel kindly supplied me with a Christmas tree apron and some Christmas tree oven gloves from their current Christmas range. I love Thornback & Peel’s designs, and I have a lot of their products, it’s all so well made and stylish, I can’t help myself but buy it. You can see more of their designs on my recipe for Eton Mess Cheesecake. 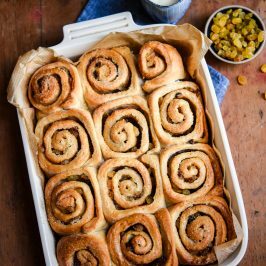 Making laminated dough is time consuming, but these pastries are really worth the effort, they taste so good and you can make these over a couple of days as the dough is really forgiving. It’s as simple as making puff pastry, but yeast has been added and the pastries need a prove before you cook them. You really should try them! The team at Thornback & Peel have very kindly given my readers the opportunity to receive 15% discount on any purchases made on the Thornback & Peel website between 13th and 27th November. Simply enter the code PATISSERIE when purchasing. 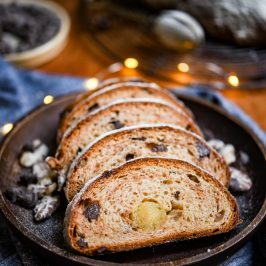 This is a lighter version of mincemeat that tastes delicious with the addition of cranberries. This has been lightened because I haven't used suet. 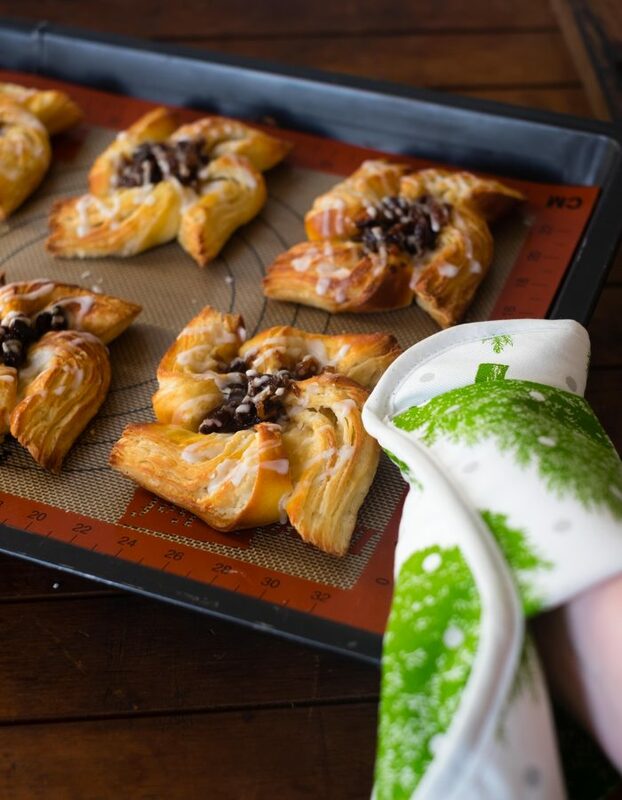 The mincemeat recipe will make more than you need for these danish pinwheels, but you can store it in a jar for use in other recipes. The mincemeat can also be made in advance. To make the mincemeat, put all of the ingredients apart from the rum into a large saucepan. Heat the mixture, allowing the butter to melt. Simmer the mixture very gently, stirring regularly, after 10 minutes remove the mincemeat from the heat. Allow the mincemeat to cool completely then stir in the spiced rum or another alcohol of your choice like brandy. The mincemeat will make more than you need for this recipe place the rest in sterilised jars. The mincemeat will keep for a few months, maturing the longer it is left. You can then use it in the rest of your Christmas baking. 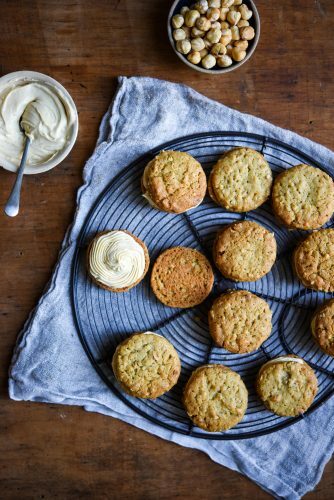 The day before you want to eat the pastries, make the base dough by mixing the flour, sugar, salt, yeast, butter and milk in the bowl of a stand mixer fitted with the dough hook. Mix on a low speed for 10 minutes, then increase the speed to medium and mix for a further 10 minutes. Cover the dough and leave to rest for 10 minutes then tip onto a lightly floured work surface, flatten slightly and shape into a square, cover in cling film and refrigerate for 24 hours. Take the 250g of butter and cover it in clingfilm, batter it with a rolling pin until it is approximately a 12cm square. Return the butter to the fridge and allow it to chill. Take the dough out of the fridge and place it on a lightly floured surface, the dough may have risen slightly overnight, so flatten it down if necessary. Roll out the pastry to a 25cm square that is 1cm thick, turn the dough so it looks like a diamond. 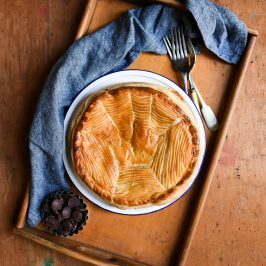 Place the butter on the diamond of pastry so that it is square. Fold the pastry in to the middle so that it looks like an envelope and then use a rolling pin to flatten the dough down. Then roll the pastry into a long rectangle, keep the work surface lightly floured and keep turning it when it has reached 22 x 40 cm fold up one end of the dough and then fold down the other end to encase it, like a letter. Return the dough to the fridge and let it chill for 30 mins. Once the dough has chilled repeat the previous step and roll and fold the dough before returning it to the fridge. Take the finished dough from the fridge and roll it out till it measures 30 x 40cm, neaten the edges and cut it into 12 x 10cm squares. Take one of the squares and make four 4cm diagonal cuts at each corner. Fold alternate points into the centre to create a pinwheel shape. Take a heaped teaspoon of mincemeat and place it in the middle of the pinwheel. Do this with the rest of the pinwheels and place them on a baking tray to prove. Cover the pastries with clingfilm and leave them to prove for 1-1hr 30mins until increased by half. Preheat the oven to 210C/190C Fan/Gas Mark 6 brush the pastries all over with egg wash and bake for 10-15minutes until golden. 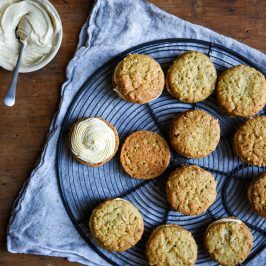 Leave the pastries to cool before mixing together the icing sugar and water and then drizzling or piping the icing over the finished pastries. Will you be making a Christmas pudding on stir up Sunday 20th November? 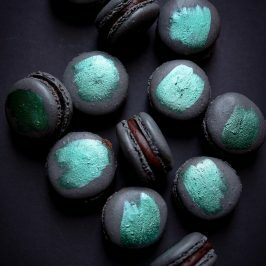 Don’t forget to the use the Thornback & Peel discount code PATISSERIE for 15% off your orders between 14th-27th November. I was given a free apron and oven gloves from Thornback and Peel, but all opinions are my own. I am so doing it! You should definitely make them! You’ll love them! Love the apron and oven mitts, very festive! Your pinwheels look great too! 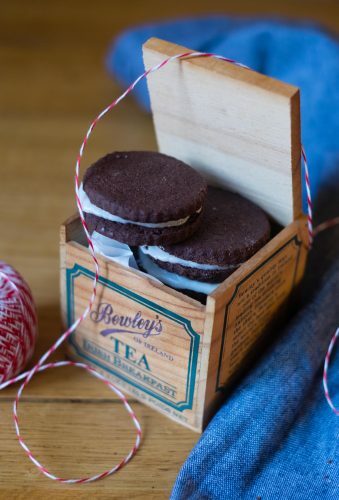 Love the holidays and all the baking suggestions and I can’t wait to see what you feature here! 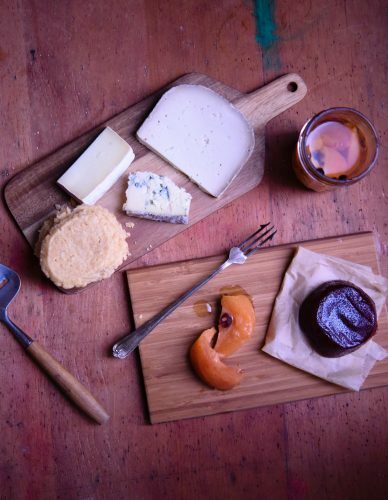 We’ll be doing pumpkin pies and probably cheesecake within the week for Thanksgiving. Can’t wait! Brilliant idea and so festive! I bet they tasted amazing as well. They tasted so good Sonali, I was so pleased with how they came out. I’m beginning to feel quite Christmassy! I just love the look of these! 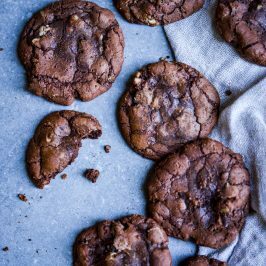 I too have started thinking about holiday baking… I guess that goes with the food blogger territory! You’re so right Natasha, it is definitely a food bloggers job to be ahead of every major foodie time of year. So pleased you like these pastries! LOVE the apron, and I’m drooling over those pinwheels, they look like they’d be in the window of a fancy bakery! Thanks Sue, the apron is fabulous isn’t it? Thank you so much, I’m glad my pinwheels impress! Totally worth the effort – they’re SO PRETTY! Thank you Jenn – I’m so glad you agree with my way of thinking! Totally thinking about Christmas in our house. I like to start planning my baked goods now so that I don’t get overwhelmed later. 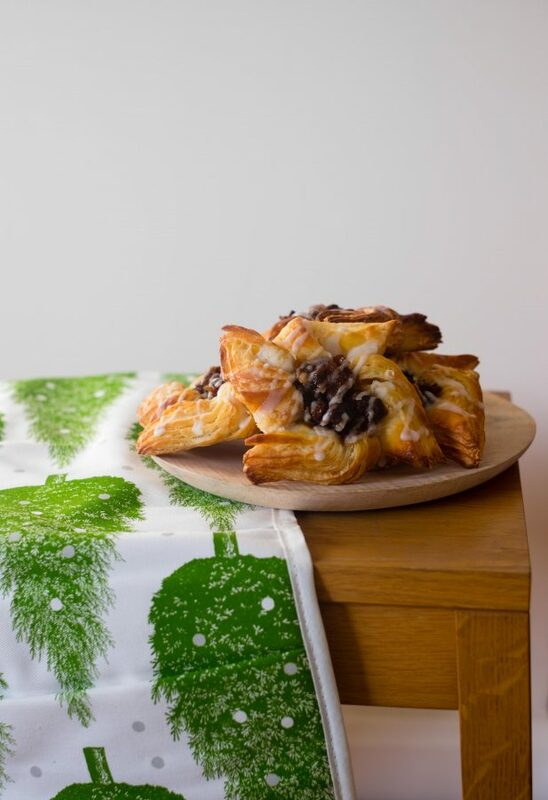 These danish will be a huge hit for the family who visit over the holidays. I’m glad it’s not just me then Amy! I have a huge list of things to make and preparation to do. Great minds think alike! What gorgeous pinwheels – such a nice change from mince pies! I also absolutely love the oven gloves! The oven gloves are so good Corina, I am so pleased you appreciate them too! These pinwheels are so impressive looking and they are very easy to make. You really do Lisa 🙂 every year I feel like Christmas creeps up on me, we’ve got a tree for the first time this year and i need to buy all of the decorations!